If the residue of great music, played over the centuries on a magnificent Stradivarius can be revealed in the very molecular structure of that instrument – what then are the effects of everything that resonates in the lives of all human “instruments”? We imprint each other with our words, actions and intentions. The Charmides quote seen on this blog, was the instigator of a large series of works in my studio, all of which explore the use of beautiful words and colour in relation to therapeutic and gallery installation settings. This “iHEAL Meditation Station”, was exhibited at Queens University last year. It contains “beautiful words” spoken in a variety of languages, as well as the original passage from the Charmides quote (156e to 157a) in Greek. 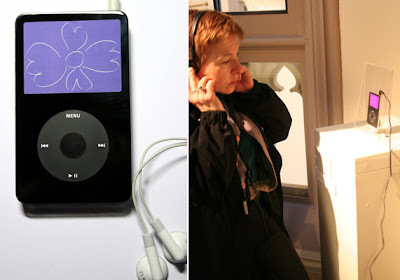 All the sound tracks are edited into an orchestra of voices weaving in and out, together with seven floral images, which cycle through the chakra colour spectrum on an iPod® video. I hope to make the application available for download, shortly. Contact me in the mean time if you are interested in a copy. I can also provide copies for institutional use. In the coming months, iHEAL may be used as part of a research project in health care settings, and is presently part of a research project on “Artist’s Books, The Canon of the 21st Century“, which will look at the innovative directions that the “artist’s illustrated book” is taking in the new millennium and will culminate in an exhibition and publication in 2009. This entry was posted on Wednesday, January 30th, 2019 at 19:43	and is filed under For Peace. You can follow any responses to this entry through the RSS 2.0 feed.